MsBubbleTea, Do you have any updates on your treatment with Lutronic Infini since it’s been about a week? 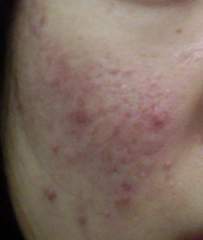 Do you feel that your acne scars have improved or do you just see holes all over your face and still redness post-treatment? I am thinking of getting this done myself as I’ve done fraxel several times in my past over several years with some improvement. I am actually maturing thru my acne stage and dealing more with the after scars...boxcars, icepicks that are still kinda red and prominent. My icepicks and boxcars are so numerous on my cheeks, I can't count them, and I've had them for almost 10 years. 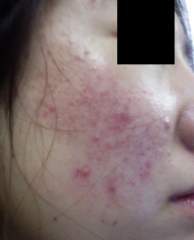 Wut procedure or regime would you recommend for my light asian (korean) scarred skin? Hi everyone, I am Korean, so I have light, yellow undertone skin, but I wanted to try out this Joppa line. Any of you experienced Joppa fanatics know which mineral foundation color I would come closest to?? I have photos in my album u can see too with ugly red blemishes that I need help in covering up. Please help me thank you! this a good vit c to use? is rose hip oil a good source of fresh vit c? i read how it is useless to apply to the skin and others live by it...i am confused too. i am wondering if i shuold just put on rose hip oil or this hyaluronic acid? is hyaluronic acid good to use on the skin? 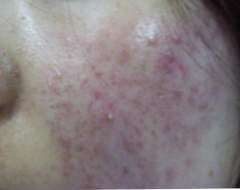 What topical regimen do you use during your TCA cross treatments? Is the "do nothing" regimen best for healing? or do u recommend things like neosporin, copper peptides, retin-a, rose hip oil, emu oil, etc, for the whole month in between crosses? thank u for any advices!! Does the sauna make red mark worst??? i heard the steam room is good for the skin, cuz of the moisture...but sauna is like hot dry air, so it will dry out your skin. I'm unsure myself and I hope it is not true, cuz i like to go to both! does rose hip oil help for scars? thank u guys so much for your responses. i have purchased rose hip mosquita/rose hip seed oil from whole food market, and the worker there said that it was suppose to help alot with scars more than their other oils. 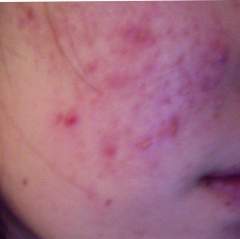 i hope it doesn't cause any breakouts...but i will inform if there are any improvements with rosehip or breakouts. i have icepick/boxcar scars, some still kinda red...and i heard rosehip oil helped for scars? any knowledge about this magic oil compared to emu, jojoba, and flaxseed oil? thank you! difference between 50% and 100% tca cross? I wanted to know the difference between 50% and 100% TCA Cross, and the overall efficiency of one over the other? I have ice pick scars, and I know 50% would be recommended to begin with...I did do a few ice picks with the 50% but it's only been about 2 wks to notice any difference after my first time too. I wanted to try out 100% because I'm hoping that there will be less applications and more collagen growth due to the higher burn percentage.